The 1/2 Sovereign is one of the world’s most iconic coins, as well as being among its most historic. The Sovereign itself dates back to the reign of Henry VII in 1489, with the 1/2 Sovereign following in 1544. The original coin’s production ended at the beginning of the 17th century and with the modern Sovereign first being minted in 1816. Production for widespread use continued until 1926, although it carried on being minted in Australia until 1933. 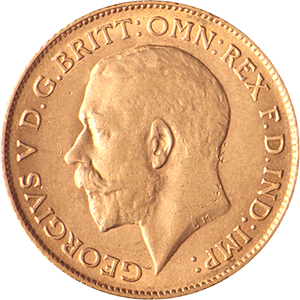 The 1/2 Sovereign has a purity of 22 carats, but soon after it’s discontinuation, coinage production largely used cheaper materials. 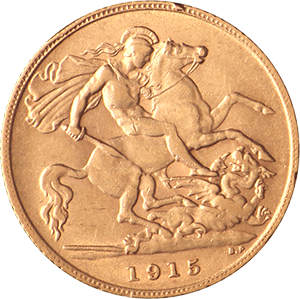 The coin is still produced, however, as gold bullion or collectors items, with tens of thousands being produced well into the 21st century. The 1/2 Sovereign measures 19.30mm in diameter, has a thickness of 0.99mm and weighs 3.99g. It has a milled edge. Due to the coin’s high collectability, as well as its relative high purity, it trades well above spot price (the gold content value alone), although this will depend on the date of production and the coin’s condition. The 1/2 Sovereign’s design is the same as the original modern version of the coin on its inverse. Depicting Benedetto Pistrucci’s iconic Saint George and the Dragon, first engraved in 1817, the coin has one of the oldest designs still in production of any coin on the planet. The coin’s most recent obverse depicts the figurehead of Queen Elizabeth II and has historically shown the relevant monarch for the coin’s era. As with any precious metal product, it is highly important to ensure that 1/2 Sovereign’s are purchased from reputable sources. Goldinvetsments.co.uk are one of the UK’s oldest and most trusted precious metals vendors. With an office in London, we are also happy to give advice regarding all forms of gold investment.